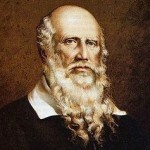 Friedrich Ludwig Jahn was born in Lanz, Brandenburg, Germany. He was a German gymnastics educator and soldier. His admirers know him as Turnvater Jahn, roughly meaning "father of gymnastics" Jahn. He studied theology and philology from 1796 to 1802 at Halle, Göttingen at the University of Greifswald. After the Battle of Jena-Auerstedt in 1806 he joined the Prussian army. In 1809 he went to Berlin, where he became a teacher at the Gymnasium zum Grauen Kloster and at the Plamann School. In 1840 he was decorated by the Prussian government with the Iron Cross for bravery in the wars against Napoleon.